Although this column is about the importance of the passion women bring to racing and the horses, we must begin by deviating from the intended path in order to lead up to it properly, with the help of a famous movie character in a famous movie and a link to American Pharoah. There has been a deluge of words written about American Pharoah over the past year, and while some of them are quite profound and poetic, it is still difficult to briefly sum up why this horse was so different and worshipped with such zeal and passion, other than his becoming the first Triple Crown winner in 37 years. We have talked about his brilliance, his class, his stride, his professionalism, and his extraordinary personality. But the words merely keep piling up, forming a morass of superlatives. And it would take a great deal of effort to sort through them all in order to get a concise portrayal of who and what this horse really was. Sometimes, we find answers and inspiration from unlikely sources, and such was the case while watching one of the iconic early horse racing movies, “National Velvet” this weekend. It was the main character, Velvet Brown, who just happened to sum up American Pharoah in one brief sentence and become the catalyst for this column. That was it. That was American Pharoah the racehorse in six words – He never puts a foot wrong. That is what made him so special. In all the miles he raced – from Santa Anita to Oaklawn Park to Churchill Downs to Pimlico to Belmont Park to Monmouth Park to Saratoga to Keeneland – he never, even in his one defeat at 3, put a foot wrong. That is a rarity and something we may not see again for a long time. It took a young girl in a 1944 movie to find the words that best describes one of America’s greatest equine heroes. It is appropriate, because so much of the passion directed toward American Pharoah came from young girls, and when I say young, I mean ages 9 to 90. The romance and love of horses never diminishes, regardless of how old one is. Oscar Wilde wrote: “The tragedy of old age is not that one is old, but that one is young.” I wrote in John Henry’s biography that the tragedy of his growing old and weak as he lived into his thirties was that, inside, he was still that young spirited colt who was always so full of life and devilment. And that is why horses are so magical to us; because they have the power to keep the fire of youth burning inside us regardless of our age. It was Velvet Brown who also provided the words that inspired so many horse-crazy young girls and ignited their passion for these noble steeds. Those words, as Velvet cradled her head against a wooden railing and gazed off into some sort of magical dreamland, have lured young girls into the world of “wonderful horses” for the past 70 years. The seed that Velvet Brown planted in National Velvet, along with a number of classic horse-related books for young readers, manifested itself on a national scale in the early 1960’s when a 12-year-old girl named Heather Noble formed the Kelso fan club, named Kelsoland, whose membership grew into the thousands. Young girls across the country, many unable to share their love of horses with others, now had found a home and were united through regular newsletters regarding all aspects of their beloved Kelso’s life, while providing interaction between members. The great gelding’s owner, Mrs. Allaire DuPont, would name Kelso’s half-sister Heather Noble. There have been many equine heroes to emerge since Kelso, but it wasn’t until racing fans, mostly females, had access to social media, mainly Twitter, Facebook, and blogs, that the intense passion for horses bubbled to the surface on a major scale, thanks to the active group "Friends of Barbaro," that led to numerous horse rescues and extensive donations to Laminitis research, and also to the larger than life heroines Zenyatta and Rachel Alexandra, which began a seething rivalry, not between the two horses, but their zealous factions. There was a book published three years ago by Carolina A. Shearer titled, “Women Will Save the World.” Could it be that it will be women who ultimately help save the racing world and its equine stars? After all, men, despite their attempts, haven’t done much to prevent the decline of Thoroughbred racing in popularity or perception. It has been through the efforts of so many horse-loving females that the number of horse rescue organizations across the country has continued to increase. Females have also been the driving force in the fight against horse slaughter and saving the wild mustangs, and are mainly responsible for the ever-increasing work of the Thoroughbred Aftercare Alliance, which is helping to unite and organize rescue organizations and racetracks in the protection of racehorses. Can one put a price on the passion and love of horses that females bring to the sport? They travel hundreds, sometimes even thousands, of miles to see horses like American Pharoah, Zenyatta, and Rachel Alexandra in the flesh, with many bringing signs and posters and providing a great deal of the electricity that runs through the track at these historic events. You didn’t see that in the 40’s, 50’s, and 60’s when the huge weekend crowds were dominated by men in suits and hats. These were mostly $2 bettors taking advantage of the only gambling outlets outside of Las Vegas. Sure there were many pure racing fans who loved seeing great horses, but in a world now inundated with gambling venues, we need these passionate women to attend the races just for the love of the sport and its heroes. We see what racetracks look like on a weekday without them. No, they are not going to singlehandedly save the sport, but they are helping to give it the necessary exposure to keep it in public awareness and keep it relevant. Pity Sports Illustrated’s editors for selecting Serena Williams as its Sportsperson (formerly Sportsman) of the Year over American Pharoah after the fans, headed by a mass influx of female votes, overwhelmingly voted the colt the honor in the fans’ poll. And pity TV and radio sports show hosts who mocked the thought of a horse being awarded. They all incurred the wrath of horse and racing lovers, mostly females, who launched full-fledged attacks on Twitter etc. As long as that kind of passion burns brightly, so will racing. I have written numerous biographical features over the years and it seems when I interviewed males, many of them became passionate about the sport and the horses from their fathers taking them to the track as youngsters. Many owners and breeders were successful in business and became involved in racing as an escape from their work, to be involved in a sport, or just to fuel their competitive fires. When I interviewed females, the majority of them grew up with horses, riding them, showing them, or just working closely with them. The love of horses was ingrained in them at an early age and the bond formed continued to grow throughout their lives. Many horse-loving young girls who went on to other endeavors as adults and couldn’t be Velvet Brown were content to dream about being Velvet Brown. I was amazed at the spiritual effect Zenyatta had on women, and wrote about several of them who told their personal stories how the great mare affected their lives and helped them through tragedies, illnesses, and other crises. Trainer John Shirreffs also was amazed at the outpouring of emotion that Zenyatta inspired. There were many other such stories in that column from women that demonstrated the ethereal relationship that can develop between humans and horses. American Pharoah apparently had a similar effect. One woman in particular I wrote about following the Travers was Shara Goldman Eltringham, who actually gave me a new perspective on the deification of racehorses, even having witnessed the Zenyatta craze. This is another example of the passion that Velvet Brown instilled in young girls through her all-consuming passion for horses. But a woman’s passion for racing is not confined to inspirational stories and schoolgirl infatuation. Although men have controlled the business side of racing, whether running the racetracks or major organizations, has there ever been a bigger mover and shaker than Marge Everett, who ran Arlington and Washington Parks and later Hollywood Park with an iron fist? Everett was known for her aggressive and innovative marketing prowess. She came up with the idea of merchandise giveaways, and her tote bag day in 1980 drew an all-time track record attendance of 80,348. She also initiated a carryover provision to the pick six, then known as the perfect six, in 1983; and was a driving force in luring the first Breeders’ Cup to Hollywood Park in 1984, while enticing numerous big-time celebrities to attend the event and present the winning trophies, which helped greatly establish its popularity. Ironically, one of the celebrities to present a Breeders’ Cup trophy was Elizabeth Taylor, who played Velvet Brown in National Velvet. Stella Thayer is owner of Tampa Bay Downs, and in 2005 was named president of the National Museum of Racing and Hall of Fame. Are there any more beloved figures in racing today than Penny Chenery and Marylou Whitney? In 2012, the New York Racing Association named Ellen McClain as its first female president. The three Triple Crown winners of the 1970s were either owned or co-owned by women – Penny Chenery, Karen Taylor, Sally Hill, and Patrice Wolfson. Karin De Francis has been a powerful figure in Maryland racing for years. New York-based Karen Murphy is one of the most prominent racing attorneys in the country, handling the majority of high-profile cases. Des Moines attorney Maggi Moss has built one of the most successful racing stables in the country, becoming the first female to be leading owner in the country in 2006 and was one of the three finalists for an Eclipse Award. In 2011, Moss won with an amazing 34 percent of her starters. Mary Scollay and Patricia Hogan are two of the most high-profile and respected equine veterinarians in the country and there are and have been many others. In fact, the vast majority of veterinary students in colleges and universities across the country are female, a trend that began over a decade ago. In 2010, for example, 77 percent of new veterinarians coming out of school were female, and that figure pertains to equine veterinarians as well. Some of the women pioneers in the field of racing journalism include Elinor Kaine Penna, Maryjean Wall, Pohla Smith, and Jennie Rees. In 1960, Elinor Kaine became the first female sportswriter to exclusively cover the NFL and did the Sunday Pre-Game show before NFL games on CBS with Pat Summerall and Jack Whitaker from 1960-71. Laura Hillenbrand, author of "Seabiscuit," has emerged as one of the most prominent best-selling authors in the country. Former exercise rider Charlsie Cantey became one of the most recognizable figures on TV in the 1970’s and 80’s, serving as analyst for NYRA stakes as well as the Triple Crown events and the Breeders’ Cup. She was seen on every major network, including NBC, CBS, ABC, and ESPN and was a reporter for ABC’s Wide World of Sports and USA’s Westminster Kennel Club. Horse-crazy girls who went on to become jockeys and then major TV personalities in racing include Jeannine Edwards, Donna Barton Brothers, and Zoe Cadman. Edwards, like Cantey, has branched off into other sports. Female jockeys have a come a long way since 1969 when Diane Crump became the first jockey to ride in a pari-mutuel race in North America and Barbara Jo Rubin became the first to win race. Since then we have had many top female jockeys and trainers, with the legendary Hall of Famer Julie Krone becoming the first female rider to win a classic, capturing the 1993 Belmont Stakes aboard Colonial Affair. Krone added the Breeders’ Cup Juvenile Fillies. 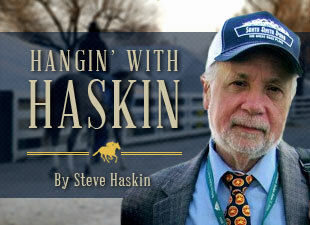 Rosie Napravnik won two Breeders’ Cup races (Distaff and Juvenile) and the Kentucky Oaks twice. Abigail Fuller became the first female jockey to win the Filly Triple Crown, taking the Acorn, Mother Goose, and Coaching Club American Oaks on Mom’s Command in 1985. Chantal Sutherland became the first female rider to win the historic Santa Anita Handicap. Emma-Jayne Wilson captured Canada's greatest race, the Queens Plate. And there was trainer Jenine Sahadi winning back-to-back Breeders’ Cup Sprints in 1996 and 97 and Kathy Ritvo, returning from a near-fatal heart condition that required a heart transplant to become the first female to win the nation’s richest race, the $5 million Breeders’ Cup Classic. Linda Rice pulled off one of the great shockers by dethroning the mighty Todd Pletcher as leading trainer at Saratoga in 2009, the first female trainer to achieve that feat. Shelley Riley came from the California fair circuit to finish second in the Kentucky Derby with Casual Lies. Other female winners of the Breeders’ Cup Sprint are Maria Borell and Carla Gaines, while Laura de Seroux captured the Breeders’ Cup Distaff with Horse of the Year Azeri. These are just some of the major accomplishments by women in racing, and it could very well be just the tip of the iceberg. For the sake of the horses and the future of the sport, let’s hope so, because in many ways, Velvet Brown has grown up.